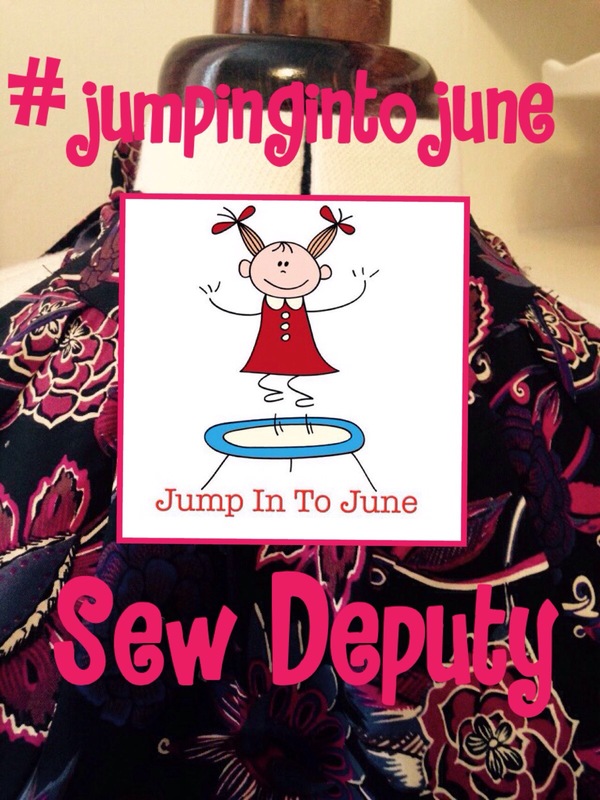 I got a little carried away with my photos so have made this a two post #jumpingintojune series so you don’t get too bored! Part two tomorrow! 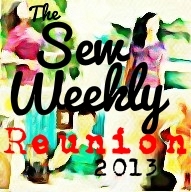 I love jumpsuits and have a few RTW but have never made one. My Grandma once made me a beautiful airforce blue ‘flying suit’ which were all the rage in the early 1980s, and I have never forgotten it! I felt quite nervous about making it and so instead of buying some fabric I looked in the stash and found some Liberty viscose from Auntie Polly, not a real auntie but one of my best friend’s mum! I wasn’t convinced I would have enough but by making the pockets and pocket yoke from plain black cotton, it all came together! I am so glad I made it! 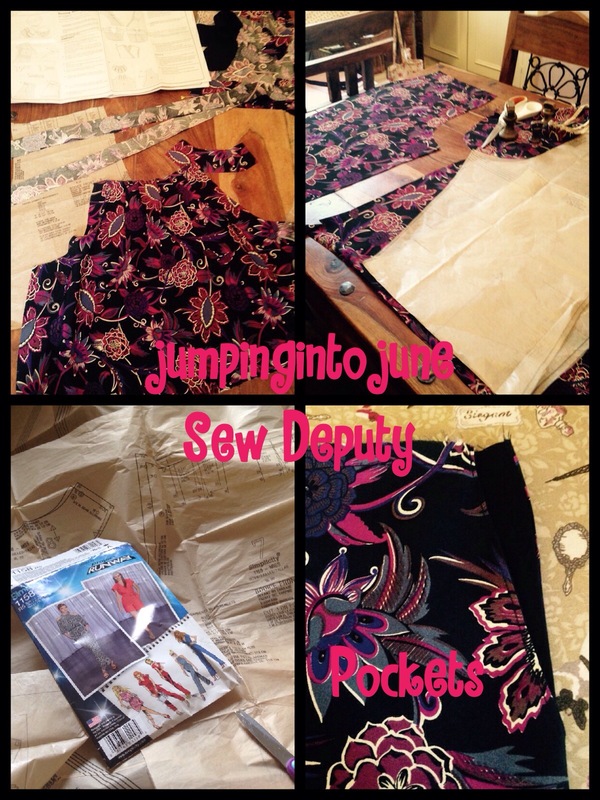 I had completely forgotten how I love sewing a new pattern – there is always an extra detail that I always miss reading about until I start sewing it! This pattern has a cross over lapped back and pockets in the front. 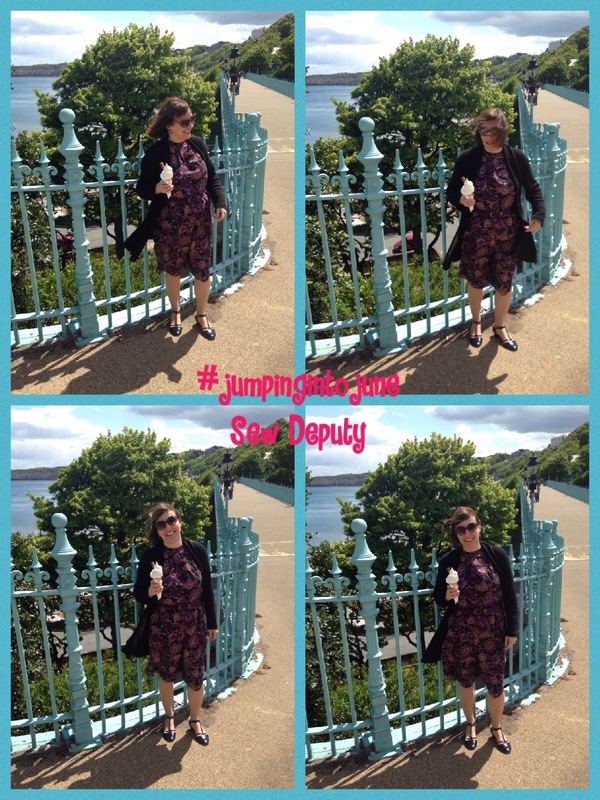 I wanted to get some jumping into June photos so decided my half term seaside visit to Scarborough on the East Yorkshire coast with my lovely Mum and Dad with the BM of course, would provide plenty of trampolining shots-*not to be*see later!! 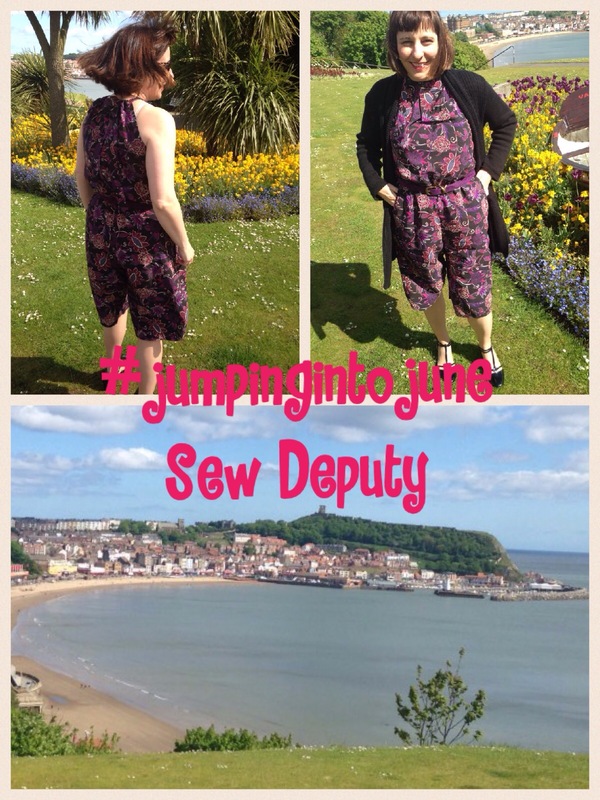 Here are some views of my jumpsuit in Scarborough! And now for the best jumping shots I could get the blog manager to take! And sadly the photos of the trampoline…..taken by my Dad! Yes, unfortunately this was a shot too far for the Blog Manager. How totally humiliated she was when I asked the trampoline man if I could sit on his trampoline steps, the camera went straight to my Dad who needed a lesson and the moment was lost! I couldn’t get back near the trampoline steps due to masses of would-be trampolinists! Do you remember me waving at the boat trip on the River Ouse?? So yes, sadly she resigned on the spot! An ice cream did cheer her up in the cutest cafe. It is situated in the Victorian beach lift cars which used to take visitors to the sea front. There are still working ones so they are in the photo too, so you can see what they were like. It was quite windy to eat ice cream! 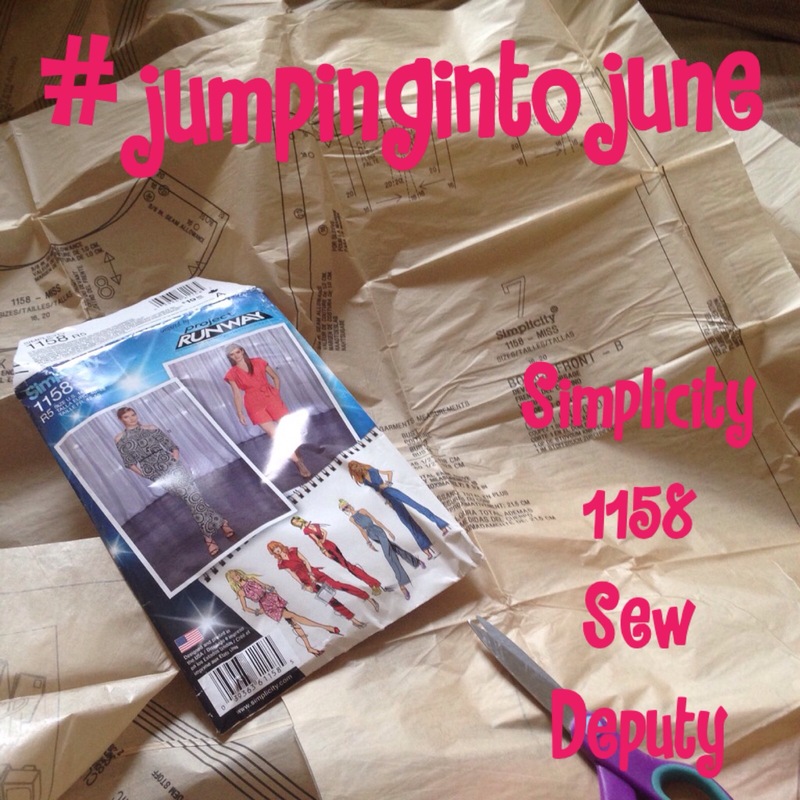 So a very eventful #jumpingintojune…..BM CVs welcome!! Wonky Factor: 8/10. ….the side seams needed 4 cm off each side, yet the rest of the fit seems good. Next time I would make the pockets open more, the top is quite restricted where I have sewn them into the seam. However, I am really happy with how it turned out! Great jumpsuit! And the photos are wonderful, I cant believe that the trampolinists didn’t get that your photo was more important than their jumping??? Anyway, great job and a lovely fabric! Hahaha! Yes! You are so right! Thank you! 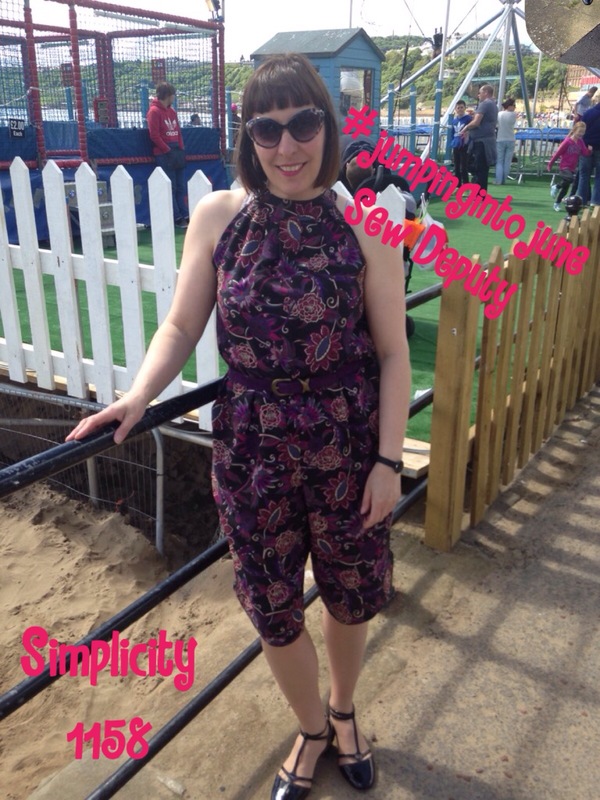 I love your jumpsuit – I haven’t worn one since (I think!) the late 70s so I was thinking it definitely wasn’t for me, but I am feeling tempted – Republic du Chiffon have a rather lovely version! I am so glad I made it! 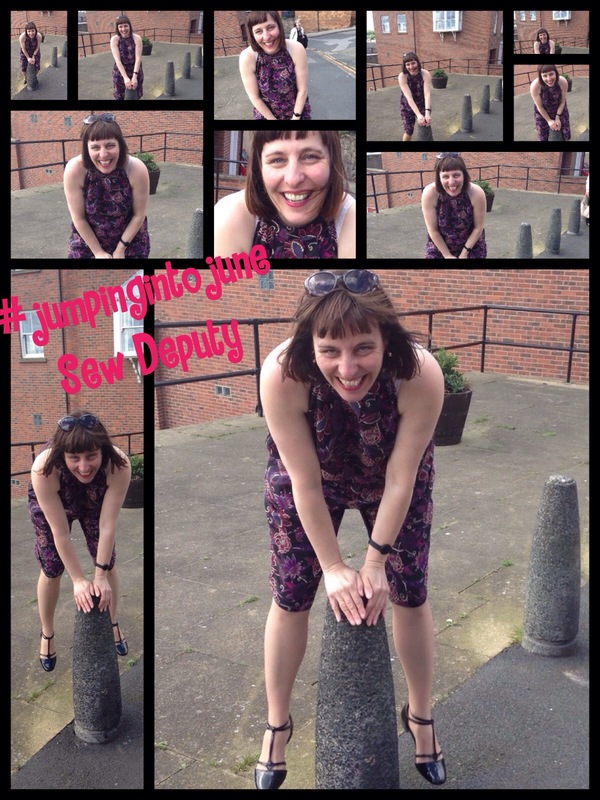 My mum always says I suit jumpsuits…do I ever listen to her!?! Maybe I will make some more…I think you should at least give it a go! You might be surprised!! Yes, I love it……move over Lotties……..jumpsuits from now on!!! Thank you! That is such a fabulous jumpsuit! You look amazing. Special thanks for the beautiful pictures of my home town. It looks idyllic from here – a very sweaty natural-fibers-only Kuala Lumpur! Thank you! 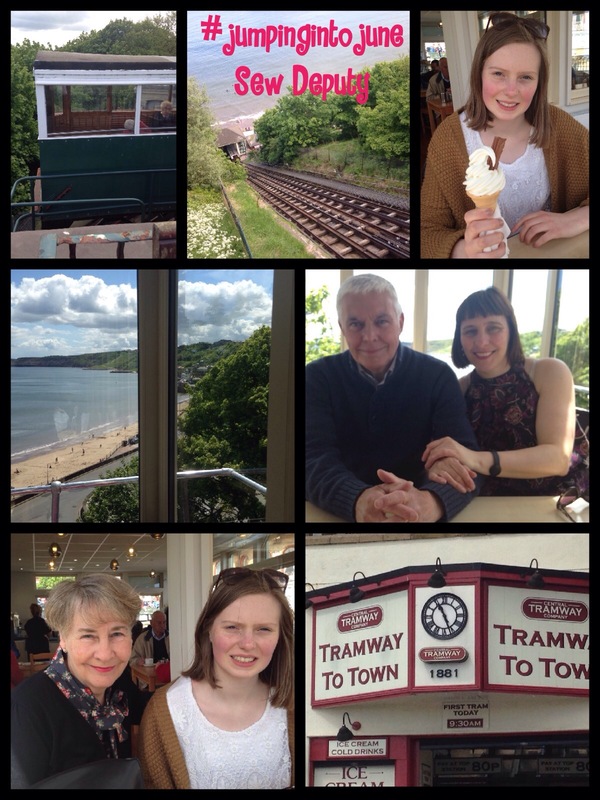 We love a visit to Scarborough! I have a friend who has just got a job where you are! Starts in September but secondary school. No idea which one! It is so cold here today I can’t even remember what it feels like to be warm!!!! Fantastic! 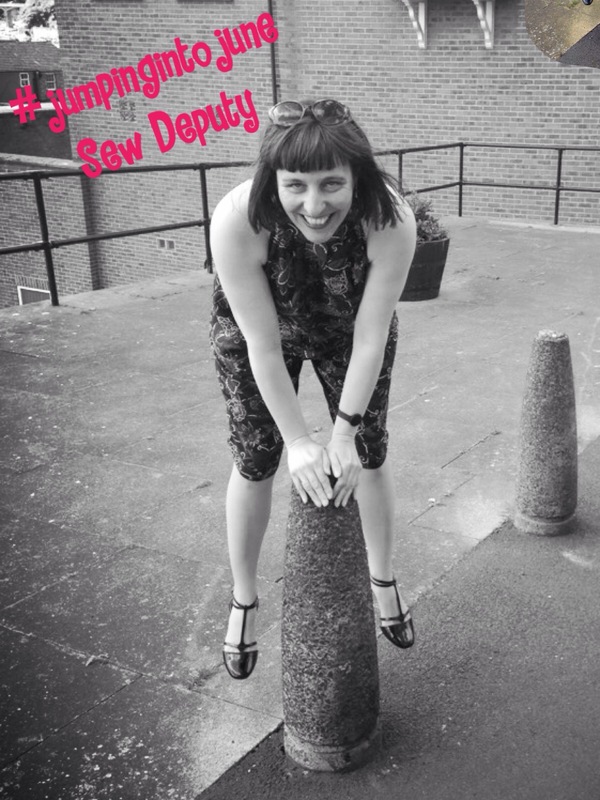 And I recognise the background on all of your photos – except the one with the bollards. You were lucky that it was sunny! Thank you! It’s a lovely place, and I love the little tram cafe!!! I’ve not been yet but I’ve heard good things. Really lovely make, Amanda! Must learn to look at a pattern for different views ~ now see view A might be a possibility… Thank you! This is so beautiful! I love your Liberty fabric. I jumped onto this bandwagon for experimental reasons, but have never EVER worn a jumpsuit. Great post. Thank you! Have you finished yours yet??? Ummmmm….. no….. I actually just finished tracing the pattern this morning. Life willing, I’ll have it cut tonight! I’d better get moving, because I want to wear it Friday night! Hahaha! Love the leap frogging!! And I can’t believe you didn’t get to go on the trampoline! After reading yours and Chris’s jumping posts I’m going to have to put some thought into my photo shoot! 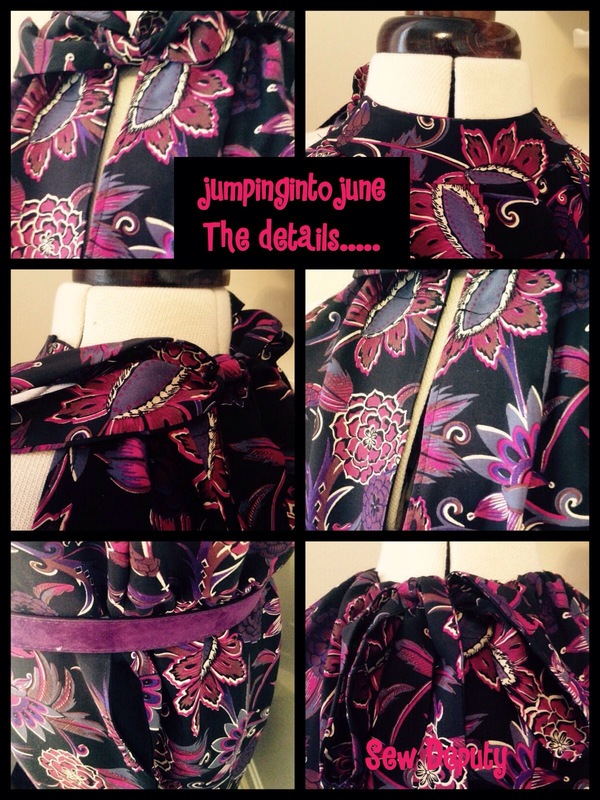 Love the style on you, and the fabric too – wonder how many more of these you’ll be making? Might run a sweepstake on Twitter! Thank you! Tbh I am not sure as this is perfect jumpsuit fabric. Am interested to see what everyone else uses for their jumpsuits as an alternative! Great set of photos! What will it take to get your Official Photographer back on side? A matching jumpsuit? Or is that not cool! Ahh I haven’t even started mine yet. Yours looks fab! So easy to wear and I love the fabric so much!